This used to be Salomondrin's car, so what does one of TV's biggest gearheads think of it? Horacio Pagani may have just dropped the Pagani Huayra Roadster onto the world, but Jay Leno’s garage, both the show and his actual garage, have just gotten a visit from a very special Huayra, owned by car collector David Lee. Lee gives Leno the keys to his car, but not before we hear a word from Pagani himself in regards to the car and its philosophy. Interestingly enough, this particular Huayra has been modified from its original spec and is different than the original car it was derived from. Heaven forbid an aftermarket tuner do the modification, though, because as a rare and beautiful piece of work, Pagani was more than happy to take in the Huayra and tune it to its owner’s desire. 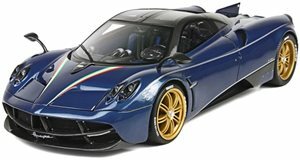 In this case, tuning was done to add some of the aerodynamic bits off of the Huayra BC to this car and then reinforce the suspension to keep up with the added forces. After a chat about the car, a very in depth one at that, Leno and Lee hop into the car for a drive around the neighborhood where they let the 6.0-liter twin-turbo V12 hiss its song, presumably one that the god of the winds likes to hear. While the Huayra itself is quiet on the roads, its styling does all the talking and simply magnetized eyeballs to it. With 730 horsepower going to the rear tires, it’s a good thing Leno drives it with extreme care, especially given that the police seem to be lurking nearby. It almost makes us miss the time when Salomondrin, the original owner, had the car and drove it like the animal that it is.